Although MiniDV remains the most popular choice among Mac users, it’s not your only option. Base your decision on how much money you’re willing to spend, whether you want to edit your video, and how picky you are about video quality. MiniDV camcorders record up to 90 minutes of high-quality video on a digital tape the size of a matchbox. The tapes are relatively inexpensive—less than $4 each if you buy in bulk—and widely available. The camcorders themselves range from $300 to $1,300, depending on their features. One reason MiniDV is so popular is the ease with which you can edit its video. Just connect a MiniDV camcorder to your Mac’s FireWire port and import the footage into iMovie or another video-editing application. When you’re done, you can burn the video onto a DVD or post it to the Web. However, working with tapes can be frustrating. You can’t easily jump to the beginning of a new scene, as you can with DVDs. Instead, you’ll have to fast-forward or rewind to the appropriate spot. And if you aren’t careful, you can inadvertently tape over previously recorded video. MiniDV Best for Mac users who want to edit their video. Shown: the Panasonic PV-GS300. MiniDVD camcorders, which range in price from $400 to $1,000, record video onto miniature rewritable DVDs. You’ll spend about $5 per disc. 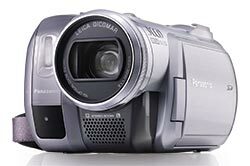 At its highest-quality setting, the typical camcorder can record around 30 minutes of video per disc. To fit on the DVD, the video must first be compressed. At high-quality settings, the resulting video usually looks pretty good, but not as good as what you’ll get from a MiniDV camcorder. The difference is particularly noticeable in scenes with lots of movement, which may look jerky. These problems are amplified if you lower the quality settings to fit more video on a disc. MiniDVD Best for people who don’t want to edit their video. Shown: the Canon DC100. The main advantage of MiniDVD camcorders is the instant gratification they offer. Once you’ve finished shooting and the camcorder finalizes the disc, you can pop the disc into almost any set-top DVD player—there’s no need to upload the video to your Mac first. Plus, you can quickly skip to different scenes, just as you can with commercial DVDs. 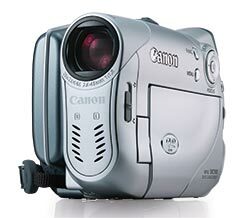 However, if you plan to edit the video you shoot, these camcorders probably aren’t for you. MiniDVD discs aren’t compatible with the slot-loading DVD drives on modern Macs: put one in, and it’ll get stuck—possibly damaging your drive. Few of them will let you download video to a Mac. This means you’ll need to buy an external DVD drive to read the MiniDVDs—adding another $120 or so to the price tag. You’ll also need a special application, such as Roxio’s $50 Popcorn 2, to convert the video data into the QuickTime format so iMovie and other Mac editing programs can import it. If you don’t like the idea of tracking down a new tape or DVD every time you want to shoot, you might prefer a hard-drive-based camcorder. These devices record video onto a built-in hard drive. For example, Sony’s DCR-SR100 Handycam can hold as much as 20 hours of video on its 30GB drive. However, these camcorders are fairly expensive: plan to shell out at least $1,000 for one. Hard Drive Best for people who don’t want to carry media. 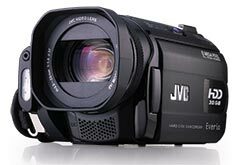 Shown: the JVC Everio GZ-MG505. And as with MiniDVD camcorders, you’ll have a hard time importing the video to your Mac and editing it, because most hard-drive camcorders record video in a format iMovie can’t read. However, you can use a program such as Squared 5’s free MPEG Streamclip to convert the video into QuickTime files. HDV cameras record high-definition video onto MiniDV tapes. Because HD video’s resolution is more than four times higher than that of standard MiniDV, HD video looks great. But the technology is still relatively expensive—prices for HDV cameras start at $1,300. You’ll also need plenty of memory and processing power to work with the video, which may mean upgrading your Mac. HDV Best for people who want high-quality video and can pay for it. Shown: the Sony HDR-HC3 Handycam. HDV camcorders are Mac-compatible, so you can import and edit the video in iMovie HD or similar applications. However, Macs don’t currently support burning HD DVDs. So you’ll need to invest in an external Blu-ray or HD-DVD burner, such as the $1,000 Philips SPD7000 Blu-ray Disc Recorder expected later this year, or you’ll have to convert the video to standard-definition video before burning it to DVD. For Mac users who want the option of editing raw video footage to create a polished movie, I recommend sticking with MiniDV or HDV camcorders. However, DVD camcorders are a great option if you just want to pop your recordings into a DVD player, and don’t plan to watch or work with that video on your Mac.